Who doesn’t love promotional buttons?!?!? Ok – I’m sure a lot of you don’t really love promotional buttons. But let’s just say for the sake of this post that you do. Well then, I found something amazing, but completely unnecessary on eBay today just for you! 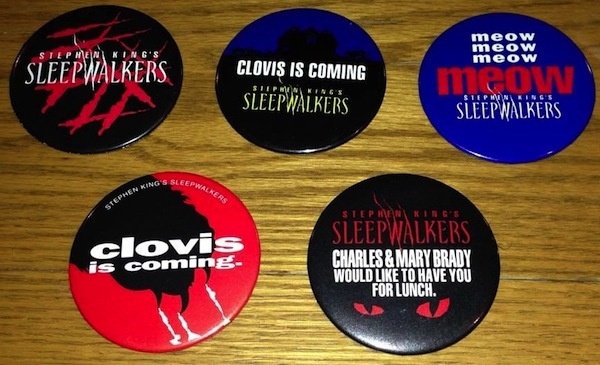 You might think those just look like some normal promotional buttons from the 1992 horror movie Sleepwalkers…….and you would actually be right. Nothing too crazy going on here, but they do all have their own sense of flair. Sleepwalkers for all purposes is not a great movie. But it is enjoyable in a ‘crappy horror movie’ kind of way, and these buttons just add to the flavor of that crappiness. It seems from two of the buttons that they were really trying to hype up Clovis The Cat too. These would make great random stocking stuffers for someone this holiday season, so if you’d like to get in on the action you can go HERE to place a bid. And after you do, you can come back and watch the one and only scene from a horror movie where someone gets killed by a corn cob.